Lots of linear activity at the south hemisphere, so an easy task to identify a suitable boundary tree, from which to generate a CSNB world map with linear tectonic activity at the map’s periphery. The tree, which becomes the map edge, is seen in white tracery in the “globe” image above. 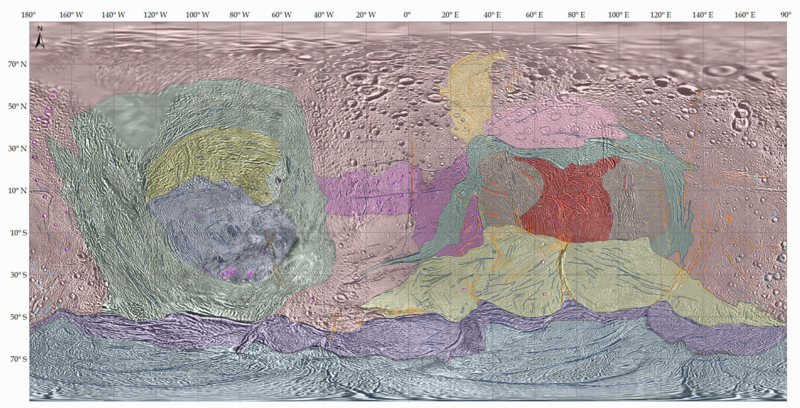 This map will be interesting to fold together because the action of the paper where the edges join might be a mimicry of what is going on the surface of Enceladus — edges of the folded globe will slip past each other in response to how one might hold or squeeze it; depending on how artful the paper joinery is done ( . . . sliding tabs . . . not sure what all). And — here’s another fun part — a similar, complementary tree can be found at the relatively quiet north pole by using a network of lines most distant from the white tracery. This tree (shown on the second globe image as black tracery) generates a CSNB world map showing south pole tectonic activity at the map’s middle. Both maps are shown in the bottom image. 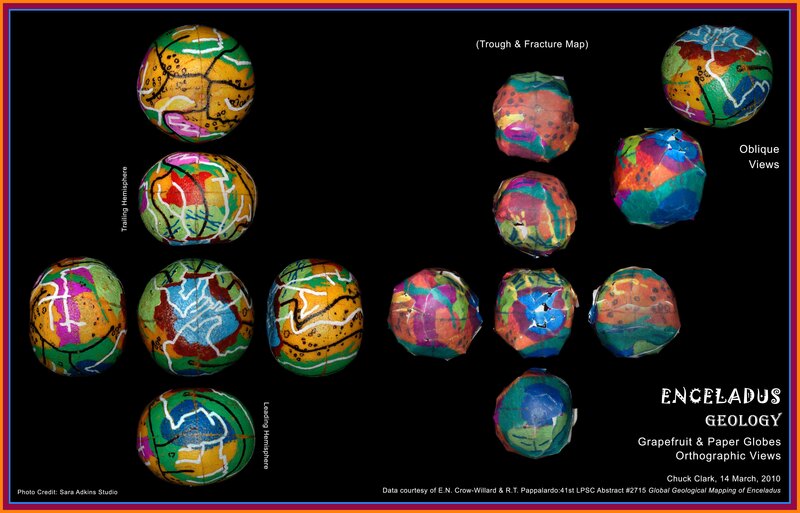 BTW, that’s the Trough and Fracture map shown folded into a globe. 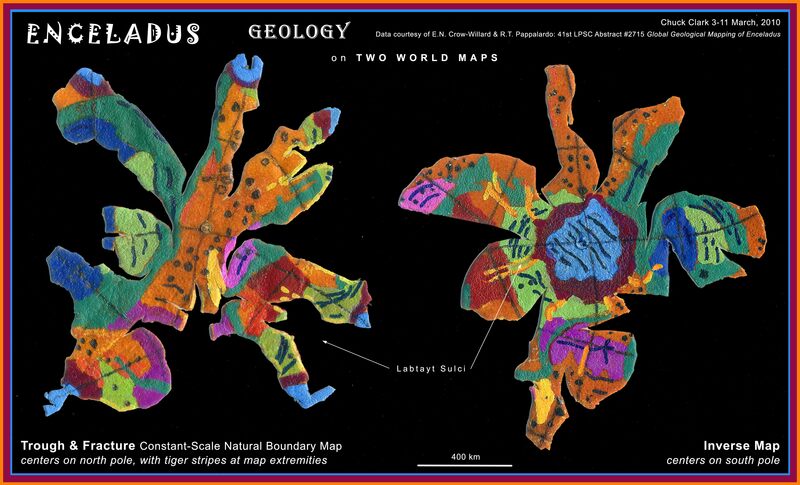 These two highly interrupted maps will next be used to generate more compact maps — think, pruning their respective trees — that will be uniquely capable of presenting the various geologic districts with minimal distortion and without interruption. They’ll display clearly the interrelationships betwixt the two opposite poles, and between the leading and trailing hemispheres that are obscured on conventional projections and impossible to see in realistic perspective imagery. 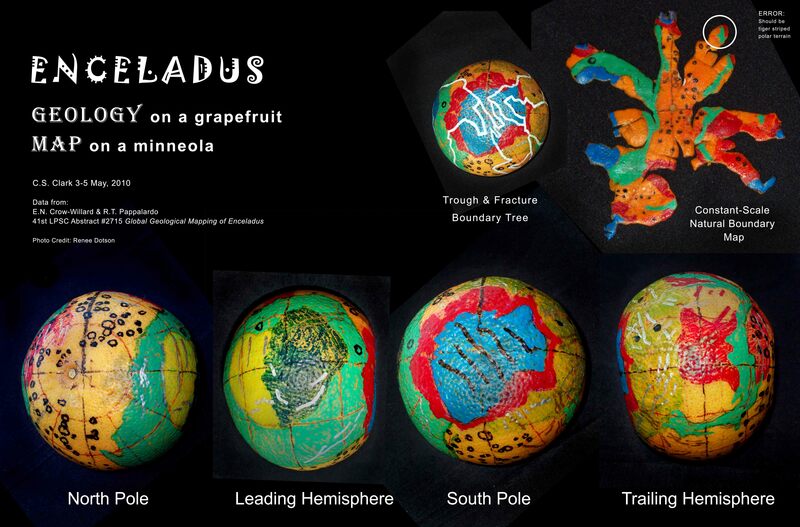 But these are sketch maps, prepared using citrus fruit during and following the 2010 Lunar and Planetary Science conference. Citrus peel, I learn, stretches when peeled, so these maps will not fold up very well. (I’ll post later some pics of the folding results; some seam slices into the field of the maps were needed). The map in the “globe” sheet is corrected and improved on the map sheet. Point is, there is now a global geological organization to the surface of Enceladus. Over next year, keep checking in for mapping updates; we’ll see if constant-scale natural boundary mapping can help identify global patterns of tectonic activity. And at the very least, we’ll have an economical way to make globes of Enceladus. have you made maps of each individual watershed as it relates to the globe? or is that just uninteresting and not useful? The idea – to create a nationhood based on watersheds where your citizenship is determined by your gps coordinates. A world based on Watershed Collectives. Both a teaching tool and a political tool to give new meaning to citizenship in a world where meaning is ever diluted. I would register in the St. Lawrence Watershed. Contact me if you’re interested in this idea.